Four photos of damaged pods or pod areas. What caused the damage? Why do reseeded crops look better this year? Various studies and crop insurance data show that canola seeded in early May tends to yield more than canola seeded in late May. Agronomy decisions are based on these trend results. But with the unpredictability of crop production, situations often come along that buck the trend. This year may be one of those years. Why? When spraying, stick to the pre-harvest interval unique to each product. When prepping bins, follow canola storage recommendations…. Dry conditions could mean a hay shortage in parts of the Prairies. 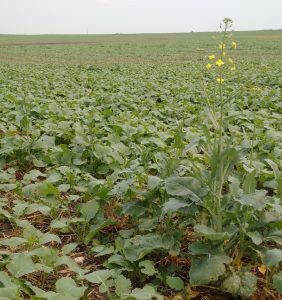 Growers with poor-looking canola crops may want to estimate the seed yield potential and weigh that against the potential feed value of the biomass. Earliest canola in southern Alberta and here and there across the Prairies will be close to swath timing in the next week or two. Many of these early fields are not looking good, with patchy emergence, uneven emergence and short stature due to moisture stress. The swath timing decision becomes more difficult in crops with plants at multiple stages of growth. Do you straight combine thin and multi-staged canola? 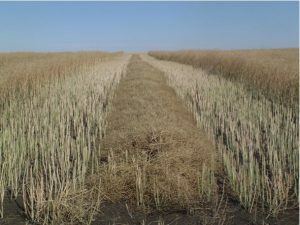 The general view is that uniform well-knit canola crops are the best for straight combining, but it can be argued that leaving thin multi-stage canola for straight combining may also be lower risk than swathing. Lygus, grasshoppers, diamondback moth larvae and early bertha armyworms have been reported, as have thrips and swede midge damage, but generally nothing requiring significant widespread action. Individual fields or parts of fields may be at risk of economic loss, but overall it is a quiet week on the insect front. Strip trials are useful tools to test a product or practice to see if it improves the standard or “check” practice. Growers and agronomists may still have a few strip trial ideas for this year, say on swathing timing, for example. Here are common ways that strip trials are mismanaged, creating results of questionable value…. The Canola Council of Canada has a campaign to demonstrate the impact of canola across Canada in support of our market access and Trans-Pacific Partnership efforts. Show your support by posting a picture on Twitter or on the website canolacountry.ca that shows your #CanolaCountry. Share an image of a canola field, you or someone you work with, your place of work, someone you do business with, or talk about how your community benefits from the production of canola and international trade.